Does that countdown really say THREE days? What a whirlwind week we’ve had, and we’re just about ready to hop on that midnight plane to Panama on Wednesday. Hmm, “Midnight Plane to Panama” – sounds a bit like a spy novel! By far our biggest achievement in this past week has been getting all of the dogs’ paperwork squared away, with every “i” dotted and “t” crossed for both the airline and the Panamanian government. Because I am married to the world’s most organized man, this went very, very smoothly with only one little moment of panic at the USDA office when the dude behind the counter thought we were missing part of the vet form. DRUM ROLL PLEASE: Here’s the stamped, signed, and blessed vet form for Rosie, complete with apostile (authentication) by the Panamanian consulate on the back. Here’s a tip: while we were at the Panamanian consulate, we got also got our marriage license and birth certificates apostiled. Down the road, if we decide to go for permanent visas in Panama, we’ll hopefully have saved ourselves some time and effort — and we also ordered our FBI background checks a few weeks ago (another requirement for the visa application). From what we’ve been told, getting the dogs imported is a cakewalk compared to the visa process and we figured we’d do as much as we could in advance. Had our last garage sale and sold our remaining car, the rest of our furniture, and our bikes (that was a sad day). Slogged through awful traffic down to San Diego to store keepsakes that aren’t coming with us in our friend Donna’s storage unit. Donna lives on her boat in the Bay of Panama and we’re looking forward to seeing her in just a few days! Ate ourselves silly at our favorite restaurants. Yes, shameless foodies that we are, we actually made a written list of restaurants we wanted to hit and food we wanted to eat that might be hard to find down in Panama! Running a half marathon has been on my bucket list for awhile. Finally ticked it off on April 11! we’ve been so busy with the stuff we were selling or leaving behind. STUFF! Is there any end to it? Get picked up on Wednesday by our lovely friends Jake and Sue, who will take us to the Copa cargo office to leave two dog-filled crates, and then to catch our flight to Panama City. Oh, fantastic and so exciting! You’ve been so busy and organized, great job. I’ve a question. I had read somewhere that there is a timing issue with the paperwork needed for Panama residency, something like it has to be done within a certain time limit or you must do them again? Hopefully, I’m wrong so no worries. Safe travels!! Yes, I think you’re right about the timing on the visa paperwork. We just figured that if we had to go to the Panamanian consulate anyway for the dog papers, we might as well get those other bits done. Hahaha, thanks! Yes, we know there’s a time limit but we figured – we’re at the consulate so why not try to kill a few birds with one stone? If we have to get it all re-done, well, luckily, we have a retired person in this family 🙂 Thanks for your good wishes. Wow, you are really doing it! You will be here in just a few days, really a matter of hours now. This is exciting. Yay, it IS exciting! See you soon! I am on my way to BH and Long Beach in a few minutes. If you need ANYTHING, please let me know. I only have two things to do today down there and then heading back up to Santa Barbara. If you need any running around, I am available, otherwise, safe journey and can’t wait to read your next posting! Yay – so glad we get to see you today! Congrats, you two!! Can’t wait to see you down there in the future! Good info on getting all the paperwork for your girls in order! At least I’ll have a starting point when it’s time to load up! Thanks, Rebecca! It won’t be long until you’re following in our footsteps. Maybe I can meet you one day when I move to Boquete – we are planning on our first visit in September to check it out! Absolutely, Diane! By September maybe we’ll have graduated from “rank newcomers” to “people that are not completely clueless.” Please let us know when you’re coming down! 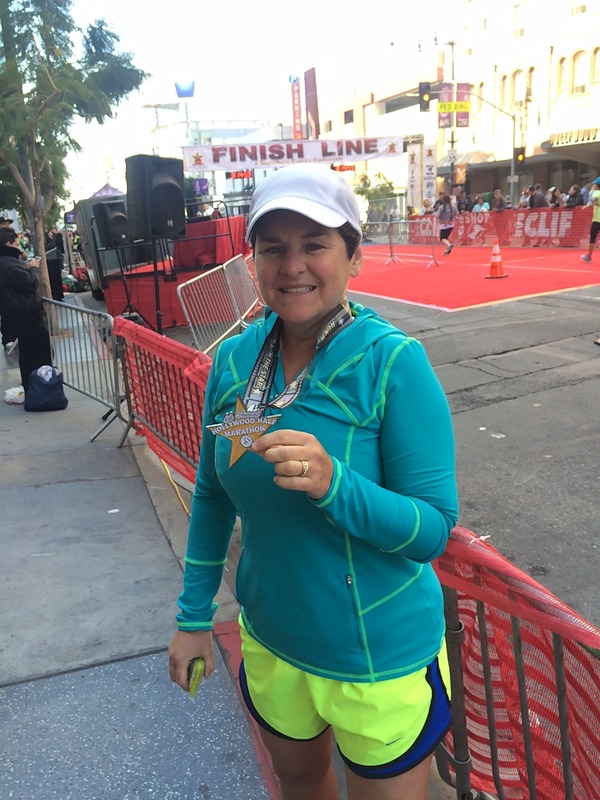 A half marathon, you go girl! We’re doing the foodie thing too.